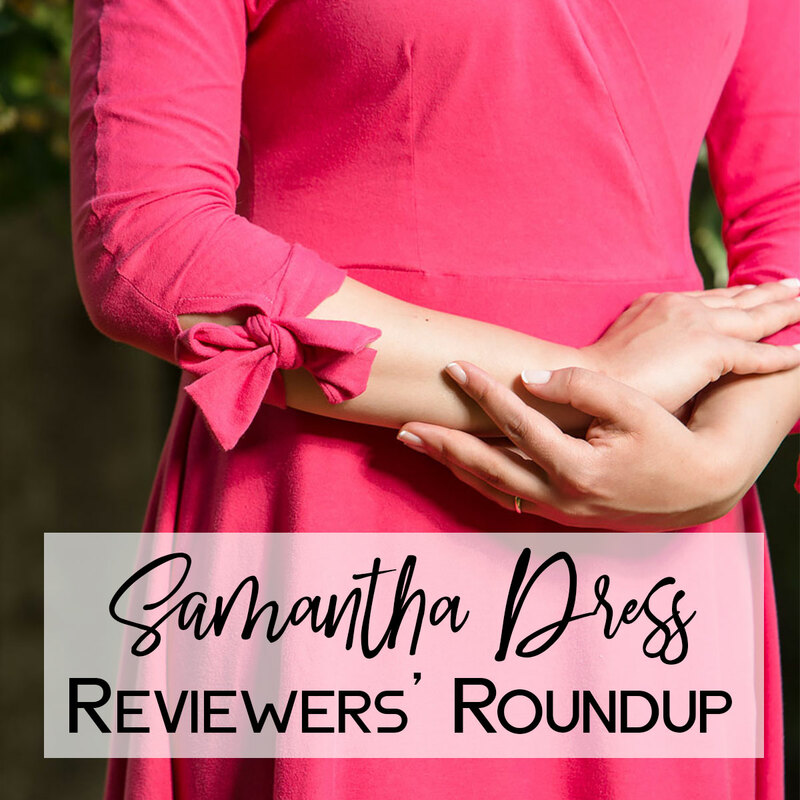 The Samantha dress was the pattern I selected for January’s Reviewers Group. 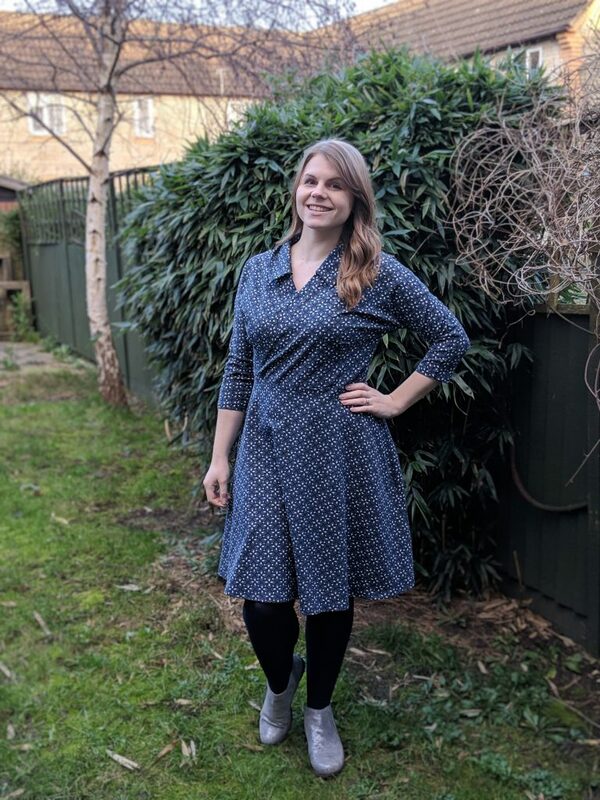 This pattern is a quick, satisfying sew and I thought what’s better than whipping a beautiful, comfortable dress in a couple of hours to beat those January blues? The Samantha dress is available in sizes UK 4-28 HERE. The first Samantha dress belongs to Stacie, also known as “Notions of a dressmaker”. She made version 1 with the shorter skirt and bows on the sleeves. You can read her full review here. 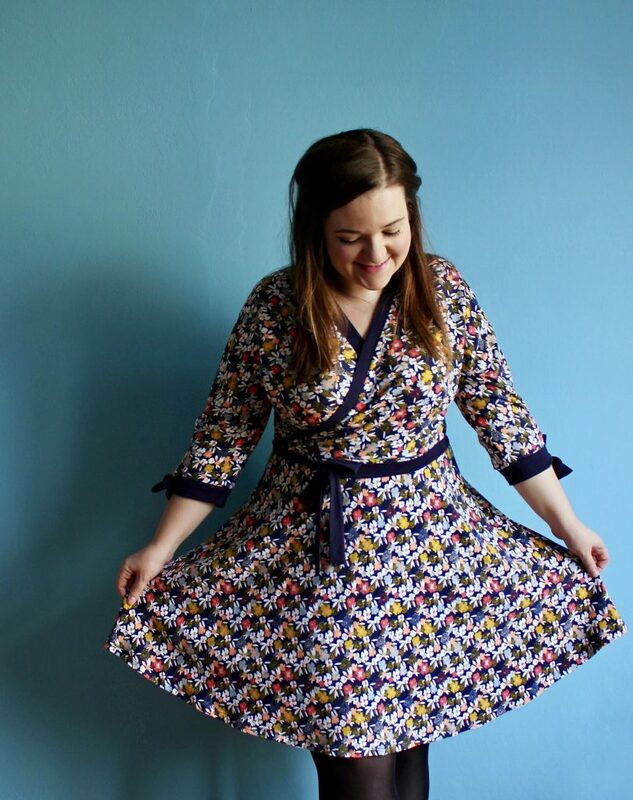 The lovely Kealy combined the features of the 2 versions included in the pattern to make her own unique dress. She opted for the collar and plain sleeves of version 2, but omitted the tie belt and used the shorter skirt from version 1. Love the finished dress, don’t you? She has a video review for the pattern HERE. “This is my newly sewn Samantha dress‼️ It is a faux wrap dress in a knit with a flared skirt. Sewn in a knit I got from a destash. Even though it has a collar this dress is a nice easy make which comes together quite quickly. The instructions are excellent. The top suits me but I’d never tried the fuller skirt. The skirt wasn’t the best on my figure so I’ve recut it and added a slimmer skirt, not an issue really, was good to try a different style skirt. I think I prefer a full wrap rather than the faux, so when I make it again I would probably follow Athina’s hack to extend the bodice to make the full wrap dress. I made version 2, I also like the sleeve cuff detail on version 1 so next time I will add that interchangeable detail. Great dress which I’ll wear after the summer heatwave is over”. Kris, also know as Sew Notes, made a fabulous Samantha in a sparkly grey knit fabric. You can read her full pattern review HERE. 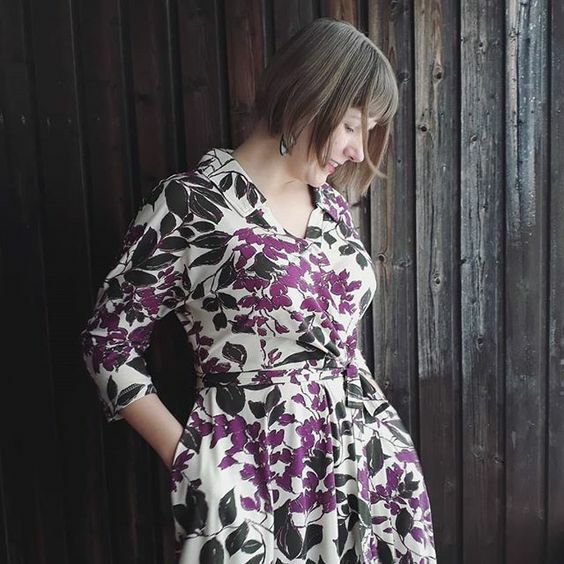 Magda is looking absolutely adorable in her Samantha! I love the contrasting neckband and bows at the sleeves. 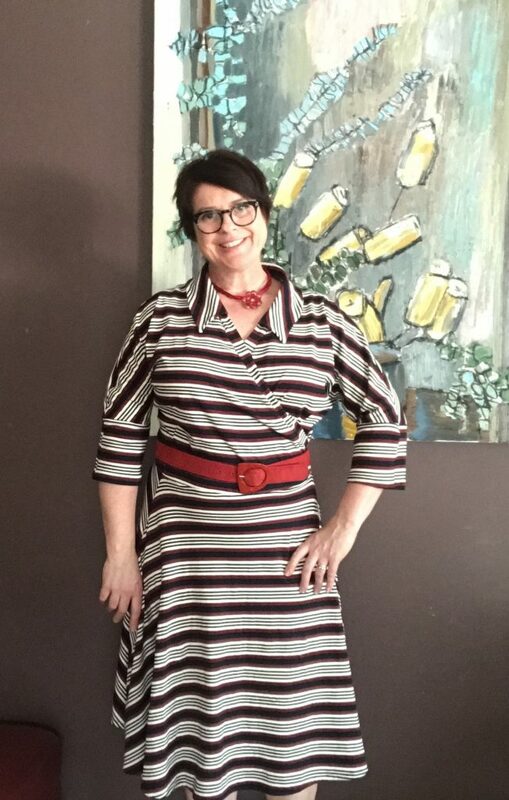 She posted her review on Instagram: “It’s a great jersey dress pattern with a wrap front. 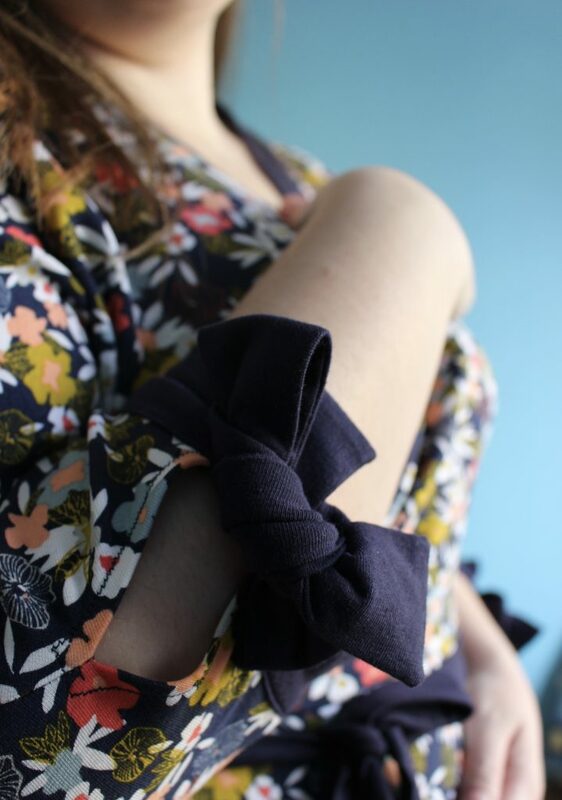 I made version 1 with the cute bows, because I can’t resist a good bow , so much so I added the waist tie from version 2 as well. Great details that give this simple dress a special touch. I also love the twirly full skirt! It went together easily and the instructions were easy to follow with clear illustrations (a minor point is that the illustration for constructing the wrap has it wrapping only to about the darts, whereas if you align the centre front notches, it wraps all the way to the sideseams, which must have been a later change). Love how the ties and slit of the sleeves were constructed. The intended fit has positive ease, but as I prefer a closer fit and my fabric had a fair bit of stretch, I went by the finished measurements and sized down. For my next version, I will also make the neckband slightly shorter, so that it sits flat around my neck. Overall a fab pattern that will be my winter wardrobe staple once I tweak the fit a bit more. Michelle’s version of the Samantha dress is the epitomy of a classic, feminine dress. 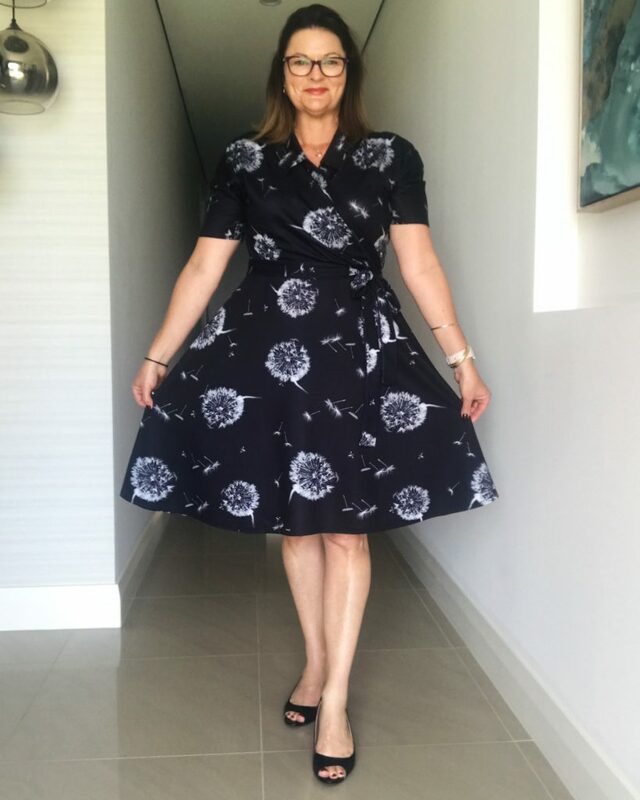 I just love it on her and I think it suits her very much 🙂 She posted her review on Instagram as well: “I was so excited when asked to review the Samantha dress pattern from AKpatterns. 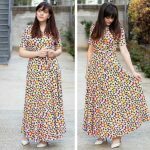 Truth be told I have had this pattern since April 2018 and fabric not long after getting the pattern and was way too scared to have a go, being such a nervous beginner like I am. But, reviewing the pattern gave me the push I needed and I was truly amazed at how easy it came together. 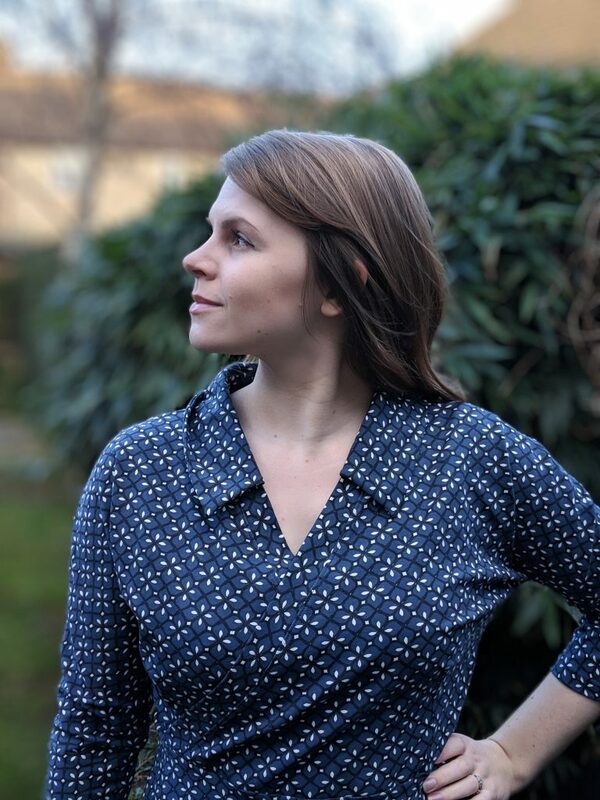 So many firsts-first time doing a neck facing and collar this way-first time sewing with a knit fabric, and first time using blog instructions for the make. 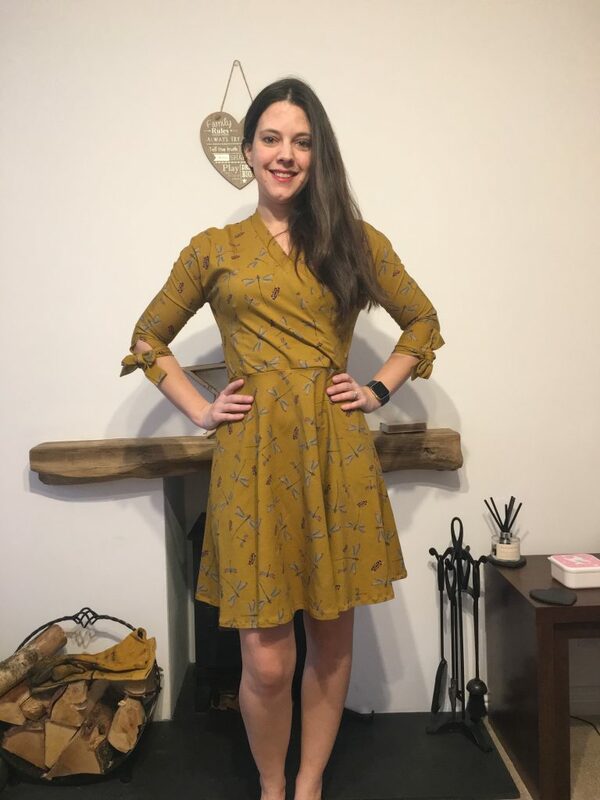 I made version 2 and can’t wait to make so many more, it’s the perfect dress for work and has given me so much courage to step outside my comfort zone. 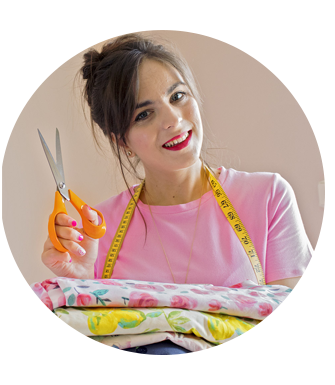 For any other beginners, if you are nervous, don’t be, Athina’s instructions on her blog are brilliant, just have a go, the end result will absolutely amaze you!!!! 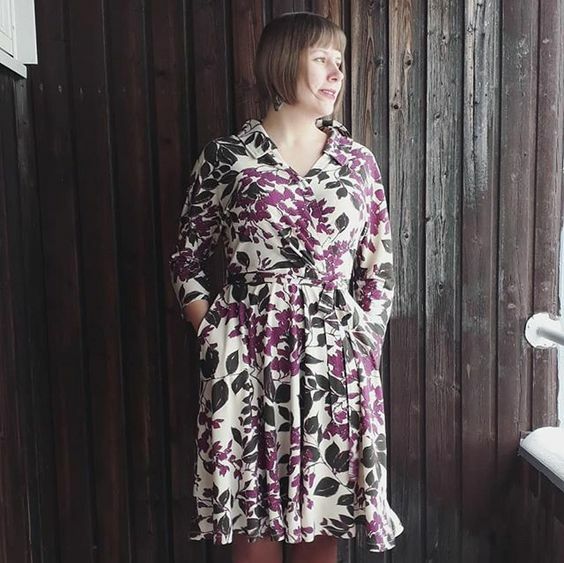 Tiina used a beautiful floral jersey for her Samantha dress. 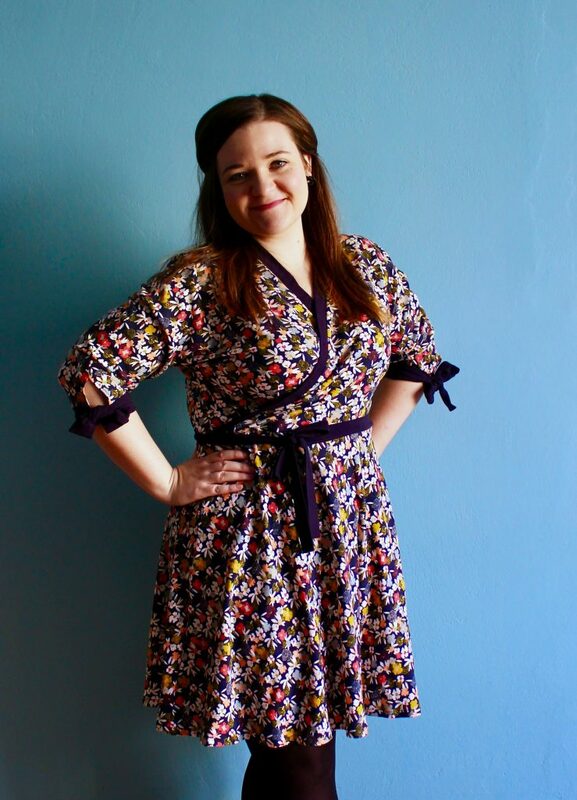 Here’s what she said about the pattern: “I received this Samantha pattern in exchange for a review. And boy am I saying yes to this dress. 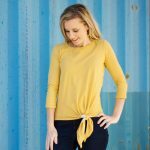 Jersey is comfortable to wear and the faux wrap top is carefree. Yet I feel stylish and polished. 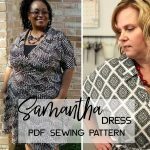 The pattern is beginner-friendly because it comes with a helpful booklet and even a video tutorial on how to sew it. 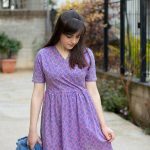 For us long-time seamstresses Samantha dress is a quick make with lovely results. Alterations: Sizing the bodice down. Shortened the bodice (I have a short torso so I must do this basically to every pattern I use). Added pleats during the fitting. Added pockets. Because pockets!! And that was it for January! Can’t wait to see what everyone will be making for February’s pattern review. Hope you enjoyed seeing their versions. 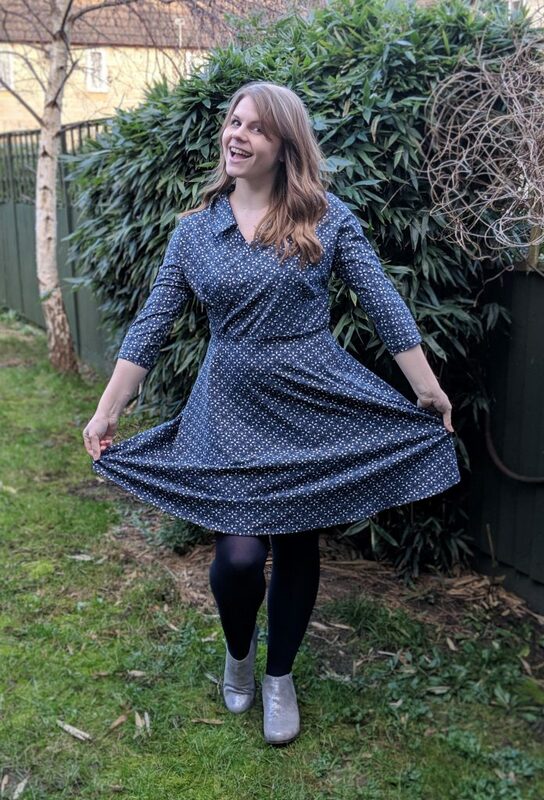 If you like the Samantha dress, you can get the pattern from my shop HERE. Until the next time, happy sewing!